Ballymena Business Centre has launched a new Enterprise Strategy to further develop Ballymena as a thriving and vibrant economic area driven by enterprise and entrepreneurship. 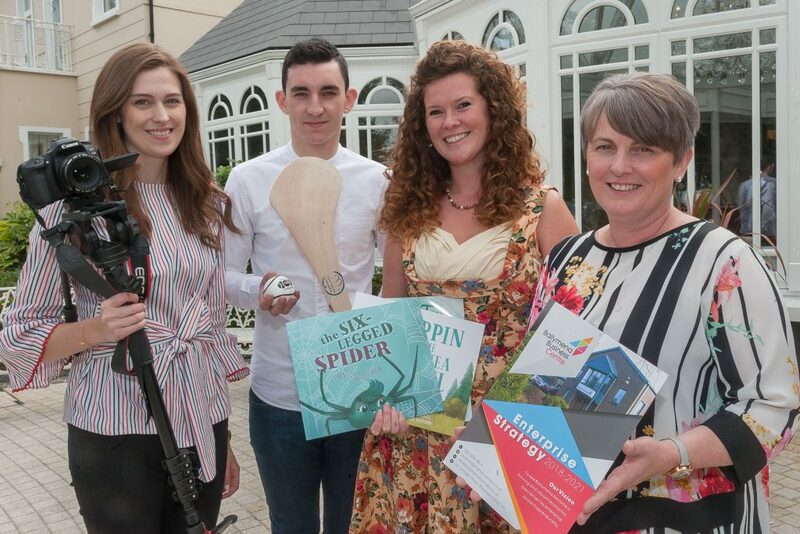 Pictured are (from left to right) Kathryn Hamilton of Day and Age Films, Emmett Martin of Martin Hurls, Jennifer Davison of Jens Sketches alongside Melanie Christie Boyle, Chief Executive of the Ballymena Business Centre. Ballymena Business Centre has launched a new Enterprise Strategy to further develop Ballymena as a thriving and vibrant economic area driven by enterprise and entrepreneurship. The organisation, a founding member of Enterprise Northern Ireland, launched its new Enterprise Strategy for 2018-2021 for the greater Ballymena area at the Tullyglass Hotel on Tuesday, 4th September 2018. Each year Ballymena Business Centre helps some 500 individuals and businesses through various support initiatives and over the last five years it has helped the creation of 300 plus jobs through employment space and secured £350k funding for the area. This is in addition to giving £120k voluntary time and £15k sponsorship back to the Ballymena community. Ballymena Business Centre, which is responsible for 120 workspace units, offices and retail space in four hubs across the community, was the first of its kind to establish a multipurpose enterprise hub in the town centre and invest in 8,000 sq ft of vacant retail property located on Church Street in Ballymena. This privately funded initiative offers office space, co working space, as well as a retail area for 54 creative entrepreneurs to showcase their design and making skills in Midtown Makers Studio and Shop. Ballymena Business Centre has launched a new Enterprise Strategy to further develop Ballymena as a thriving and vibrant economic area driven by enterprise and entrepreneurship. Pictured (from left to right) are members of the Ballymena Business Centre, James Perry MBE, Vice Chair, Cllr Audrey Wales MBE, Director, PJ McAvoy, Chairperson and Melanie Christie Boyle, Chief Executive alongside Sir William Wright CBE, local entrepreneur and Wright Group owner. 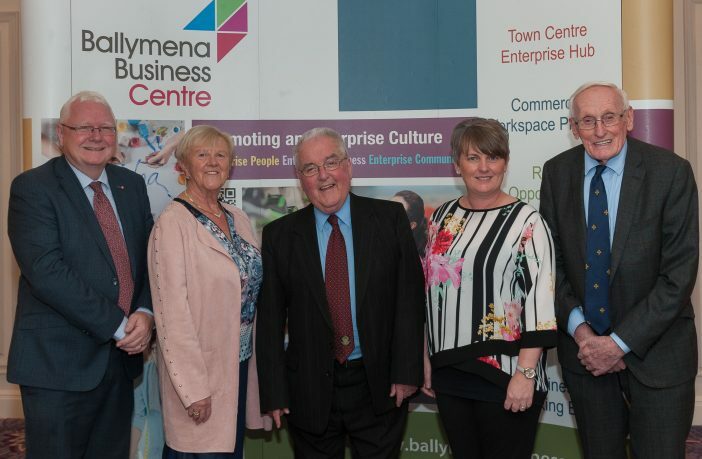 Ballymena Business Centre’s 2018-2021 Enterprise Strategy is a four-year action plan set to promote enterprise and entrepreneurship. Chief Executive, Melanie Christie Boyle explained; “Ballymena Business Centre plays an integral role within the local community, we are keen to build on our achievements and develop innovate solutions to drive growth within our local economy. 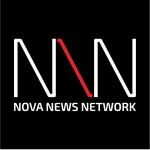 “Going forward we will empower entrepreneurs to share knowledge and champion enterprise; deliver enterprise outreach activities across urban, rural and disadvantaged communities and hard to reach groups ensuring that enterprise is accessible to all within our community. 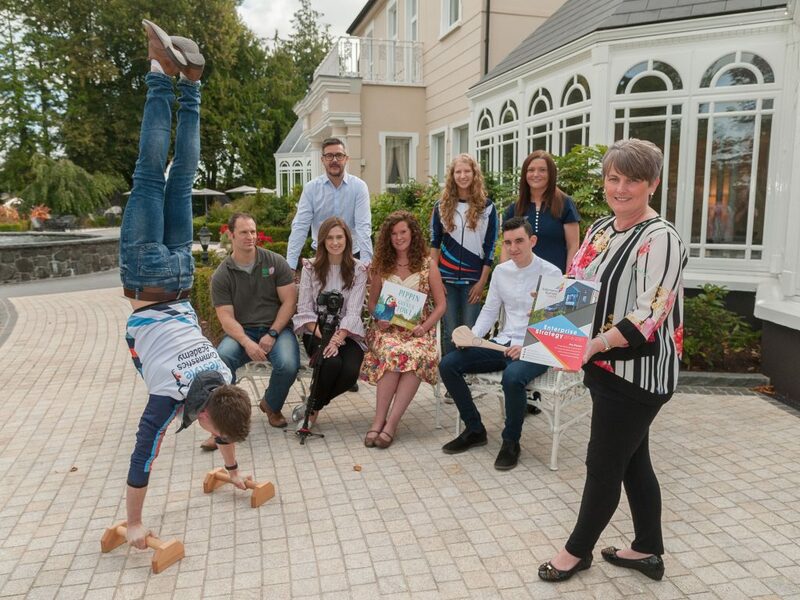 Pictured are some of the local entrepreneurs at the Ballymena Business Centre’s Enterprise Strategy’s launch with Melanie Christie Boyle, Chief Executive of the Ballymena Business Centre, John Mills showing his gymnastic skills from Lifestyle Gymnastics Academy with (left to right) Mark McIntyre of New Leaf Hub, Kathryn Hamilton of Day and Age Films, Jennifer Davison of Jens Sketches, Emmet Martin of Martin Hurls. Back row, Gary Tinsdale of Tinsdale Furniture, Kathryn Mills of Lifestyle Gymnastics Academy and Lynne McCartney, a receptionist from Galgorm Dental. 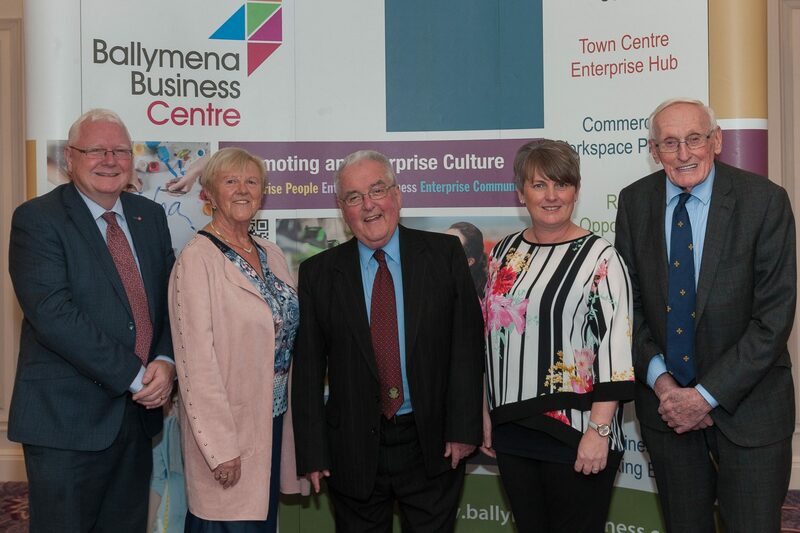 Ballymena Business Centre operates as a self-sustainable social enterprise with a stable financial position, well managed assets, cash flow and profitability. Local entrepreneur and Wright Group owner, Sir William Wright CBE, who was founding Chairperson of the Ballymena Business Centre, was acknowledged at the launch for his great contribution, leadership and entrepreneurial role in the wider business community. Mayor of Mid and East Antrim, Councillor Lindsay Millar, who attended the launch, said, “It’s imperative that we work in partnership with our stakeholders. Ballymena Business Centre is one such key stakeholder that has helped the greater Ballymena area continue to thrive. The Centre, which will be celebrating its 30th anniversary next year, was recognised as a Northern Ireland charity in 2005.